What Is a Lightning App? Describe the benefits of Lightning apps. Create a Lightning app with custom branding. List two best practices for planning Lightning apps for your org. An app is a collection of items that work together to serve a particular function. In Lightning Experience, Lightning apps give your users access to sets of objects, tabs, and other items all in one convenient bundle in the navigation bar. Lightning apps let you brand your apps with a custom color and logo. You can even include a utility bar and Lightning page tabs in your Lightning app. Members of your org can work more efficiently by easily switching between apps. What’s most important to sales reps? Accounts, events, and organizations. How about sales managers? Reports and dashboards make the top of the list. Let’s jump into the details. Think of the navigation bar as a container for a set of items and functionality. It’s always there, but the items within it change based on the app you’re using. The app name displays on the left side of the navigation bar (1) and custom colors and branding (2) make each app unique and easy to identify. Your users can access other items and apps by clicking the App Launcher icon (3) or the app name. Your users can create records and access recent records and lists directly from the navigation bar (4) for items like Opportunities. So what things can you put in a Lightning app? You can even include Lightning page tabs and utilities like Lightning Voice. If your org uses utility features, you can enable a utility bar in your app that allows instant access to productivity tools, like integrated voice, in the Lightning Experience footer. You can also build your own on-demand apps by grouping items into new custom apps. To switch between apps, users can use the App Launcher ( ). This makes it easy for users to switch contexts and still have access to the items, objects, and pages they need most. The App Manager is your go-to place for managing apps for Lightning Experience. It shows all your connected apps and Salesforce apps. 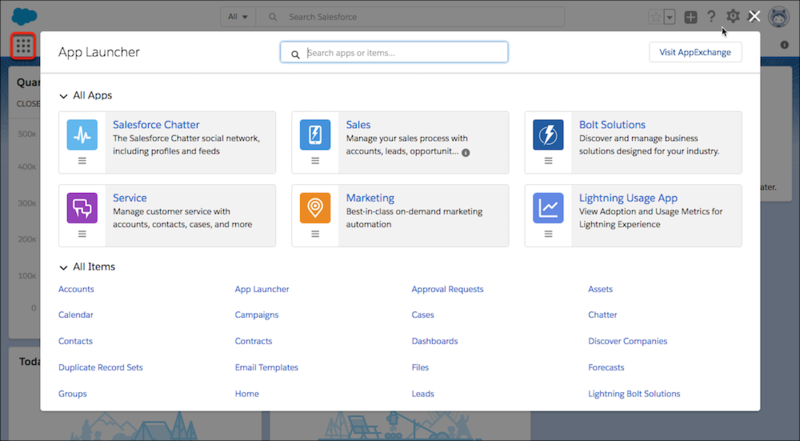 View all your Salesforce apps. Create Lightning apps or connected apps (1). See which apps are visible in Lightning Experience (2). Click a column header to sort the list based on that column. What does that “Visible in Lightning” column mean? You can see in the App Manager that there are two types of apps: Classic and Lightning. A checkmark in the Visible in Lightning Experience column means that the app is accessible in Lightning Experience via the App Launcher and is fully functional. 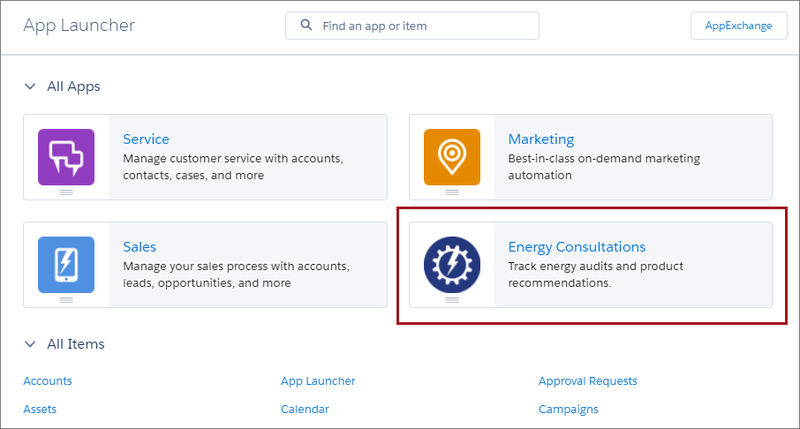 Classic apps that don’t have a check mark in the Visible in Lightning column are enabled only for our Salesforce Classic UI. Because you’re working in Lightning Experience, you won’t find those Classic-only apps in the App Launcher. Classic apps marked as visible in Lightning Experience are fully usable in Lightning Experience, but they don’t take advantage of the app enhancements that Lightning Experience offers. Creating and editing a Lightning app is a cinch. As Ursa Major Solar’s admin, Maria needs an app that puts everything about customer energy assessments at her consultants’ fingertips. Let’s dive right in and try it out. In a few simple steps, you can give an app a name, set its primary color, upload a logo, specify which items appear in the app’s navigation bar, and assign the app to user profiles. From the Home tab in Setup, enter App in the Quick Find box, then select App Manager. Walk through the Lightning App Wizard, creating an app with these parameters. Description Track energy audits and product recommendations. Use a JPG, PNG, BMP, or GIF image that’s smaller than 5 MB. For best results, upload an image that’s 128 by 128 pixels. Images larger than the maximum display of 128 by 128 pixels are automatically resized. Utility items Don’t add any. Maria would assign it to her consultants’ user profile, but for our purposes, it’s easier to test if we set it to System Administrator. Click Save and Finish to exit the wizard. Click to open the App Launcher, and select the Energy Consultations app. Check out the new app! It’s got all the custom branding you gave it: a custom icon in the upper left and the custom color you assigned to it. Because Home is first in the navigation bar, it becomes the first page your users see when they open the app. Nice work! Now you’re ready to create your own custom Lightning apps. Did you know that app images for Lightning apps can be animated GIFs? Oh yes, they can. You're welcome. It’s time for the fun part: deciding how to set up Lightning apps for your users. Here are some tips for planning Lightning apps for your org. Talk to your users. Ask them what their priorities are. Customizing tabs in apps gives you a unique opportunity to engage with your users. Each group of users has its own priorities. Find out which objects and items represent their highest priorities. Ask users to post feedback to a Chatter group. Schedule lunch sessions. Everyone likes a free lunch, and nearly everybody is happy to express their opinion. Create a master list of objects that everyone in your org wants. Then trim down the list for each group—sales reps, sales managers, execs, and so on. The menus for every user group share some common objects, like Home, Tasks, and Feed. Keep the high-priority items for each group at the top. Put low-priority items at the bottom, or remove them altogether. Users can always go to the App Launcher to get the items they use less often.